Em Stafrace| Just a Girl with Ideas: A LITTLE BIT OF ROMANCE! A LITTLE BIT OF ROMANCE! Week 2 of the 'Postcards from around the World' comp and I finished the LO in record time, yippee! Now I'm not a vintage kind a gal, but me thinks me likey shabby chic and its the perfect style to capture the vibe of Provence, our second destination! Here's the postcard and my LO! and a detail of the layout so you can see the quote! Oh my gosh I had so much fun with this LO using Structure Gel...my new favourite thing! I printed off an image of a rose on my deskjet printer and using the gel transferred it onto my cardstock base. The reason the image is so milky is because it was printed on basic A4 paper, but may also be because my printer was set at transparency so there was less ink used. Now if you've not played with this goo or something like it then do yourself a huge favour and purrrr-chase a tub of this wonder-fantastical product! Its so much fun to use and creates some random textures to your page. 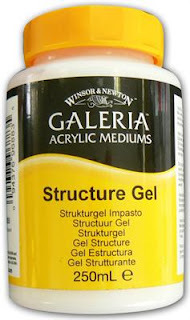 Its main purpose is similar to Gesso which when mixed with acrylics you can build up layers as transparent or opaque as you like with your paint pigments...buuuuut it also has another application as an image transfer medium, which has many many possibilities to adorn your projects in different ways. The idea is to use glossy images that are printed in magazines of which you get the best results but the inks you use in a standard photocopier work just as well. The funny thing is I discovered purely by accident back in my Art school days a similar way to do it using turps and a photocopied image, but this limited you to just a back and white image and also left an oily surface surrounding the transferred image which I combated by firstly priming my paper or canvas with gesso. However this product screams use me, use me so now you'll probably be seeing lots of gorgie piccies and lots of trial runs which I'll document, like using home printed photos, newsprint amongst other things, so stay posted for some Structure Gel techniques! Thanks for stopping by for a read. Wow that gel sure sounds interesting Em...your LO is divine...how clever are you!! Just a beautiful LO. You'll have those wedding photos scrapped in no time at this rate :D.